A New Online CMTE Course…Open Now! I’ve been facilitating early childhood music programs since graduate school, before I was even a full-fledged music therapist. I’ve continued to do so all of these years, and it has been so exciting and fulfilling to see my programs continue to grow and touch the lives of many young children (and their families). 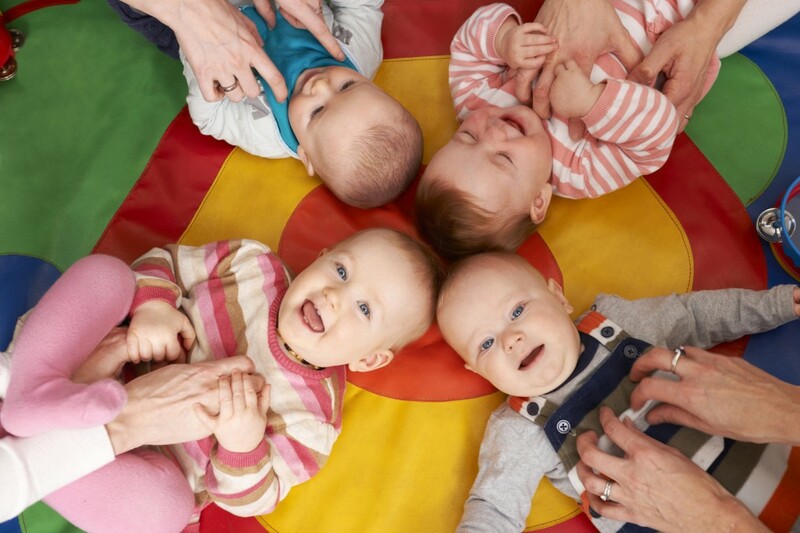 After reading dozens of emails from fellow music therapists and educators asking for advice on starting an early childhood music program, I decided to take the plunge and create an online CMTE course on this very topic. It covers the entire process — from conception to the very last class — and everything in between. This 3-hour CMTE course consists of 3 chapters, and each chapter is made up of 6 videos. Watch the videos at your own pace and on your own time; once you register, you will have 3 months to complete the videos, final evaluation, and post-test. Each video comes with a downloadable audio track and PDF of the slides in the video. BONUS: You will also receive 12 songs (including mp3, instrumental track, and lead sheet) from the Listen & Learn Music collection. That is $36 worth of music at your fingertips, which you are invited to use as inspiration for your own early childhood program, or include in their original form. You are also welcome to create adaptations and use the instrumental track to record your new versions. What Kind of Program Will You Create? Please note that I will be answering all questions posted by course participants inside the course. I want this course to be as interactive and educational as possible so that you have the resources to go forward and create a successful program. The price of the course is $75, which includes the bonus mp3/instrumental track/lead sheet downloads ($36 value). Once you complete your payment safely and securely via PayPal, you will be redirected to the registration page. Upon registering and logging in, you will have full access to the course for 3 full months. If you have questions, feel free to leave them in the comments below. Looking forward to seeing you in the course! This month has been insane. Between changing my business structure, moving my office/studio to a new location, seeing a full load of student, starting new sessions of two different early childhood classes, and creating an online CMTE course, I’m lucky I’m still sane enough to type this blog post. A few weeks ago, in an attempt to organize all the chaos, I entered everything into iCal. Then I used the Reminders app to make lists for each different area of my work and life that needed attention. I could access both my calendar and lists from my iPhone, iPad, and laptop, so I thought everything would be under control. But I was wrong. Things were still slipping through the cracks, and whenever I found a free block of time to get something done, I would be overwhelmed and have no idea where to start. So one night I went old school and wrote out a list of things I had to do the next day. Thanks to the list sitting on my desk the next morning, I knew exactly where to start and how to budget my time. I didn’t waste precious minutes with things that didn’t need to be done right away; instead, I went right down the list, crossing things off as I finished them. You really don’t get the same satisfaction from check-marking an item on your iPhone as you do drawing a line through something with a sharpie, do you? It’s amazing how focused and motivated I am when I sit down to work each day, because I know that my goal is to have crossed off every single item before I go to bed that night. I use these small notepads (of which I have several, thanks to giveaways at AMTA conferences!) so that I can’t fill it up with too many to-dos; keeping the list relatively short allows me to concentrate on the MOST important items. And if for some reason something doesn’t get done that day, I write it down on the next day’s list. This doesn’t happen often, though, because nothing irks me more than throwing away a list with items left uncrossed! Parker had his 15-month well visit this week, and despite getting 4 shots plus a toe prick, he was a champ. He was pretty chill and let Dr. Phillips listen to his heart, look in his ears, and even take a peek at the molars that are starting to come in. I always hold my breath a little when it comes time to take all the measurements, because Parker has been such a tiny peanut from the very beginning. He only gained one pound since his 12-month visit, but I wasn’t too surprised considering he is ALWAYS on the move (and still not the best eater). 12% is the highest he’s been on the curve since he was born; hopefully the upward trend continues. The pediatrician was happy with his progress and said he looked perfect, which is always reassuring. Plus, he can tell me the sounds for dog, cat, cow, pig, sheep, duck, bird, lion, monkey, frog, train, doorbell, and drum. If I ask him to say a word, he will almost always do so, and he is pretty good at imitating without prompting, too. One sweet little story to end this post about my big boy: last night, Parker woke up crying at around 12:30 (which never happens). 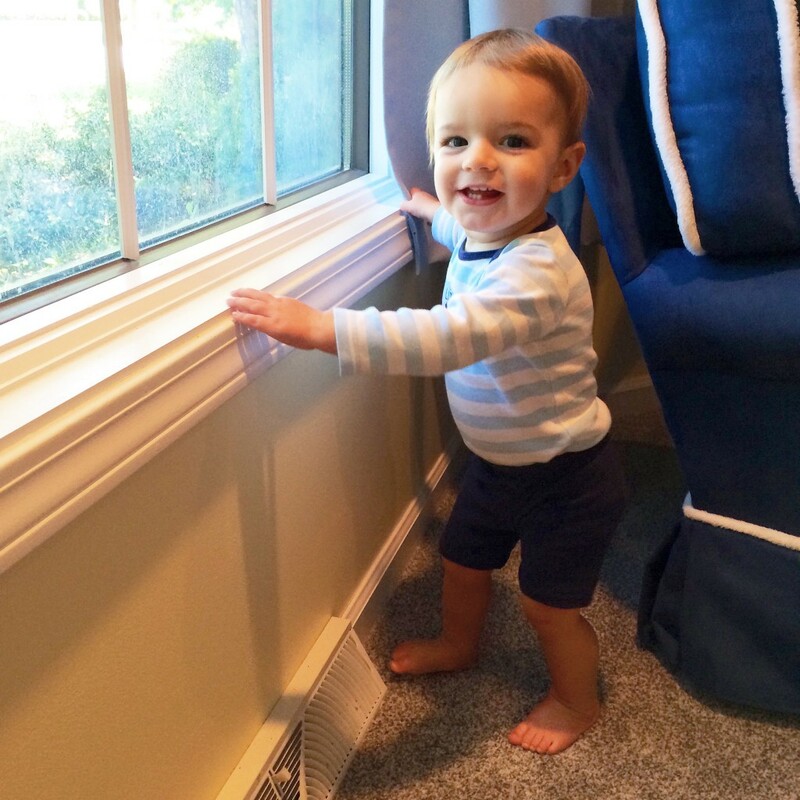 I picked him up out of the crib, and he wiggled to get down. He walked over to the rocking chair and pointed to it, so I picked him up and we rocked for a few minutes. Parker has an obsession with all things Sesame Street. He asks to watch it multiple times a day, and when he hears the theme song he comes running and dances along to the music. He knows the characters’ names, and can identify them verbally. 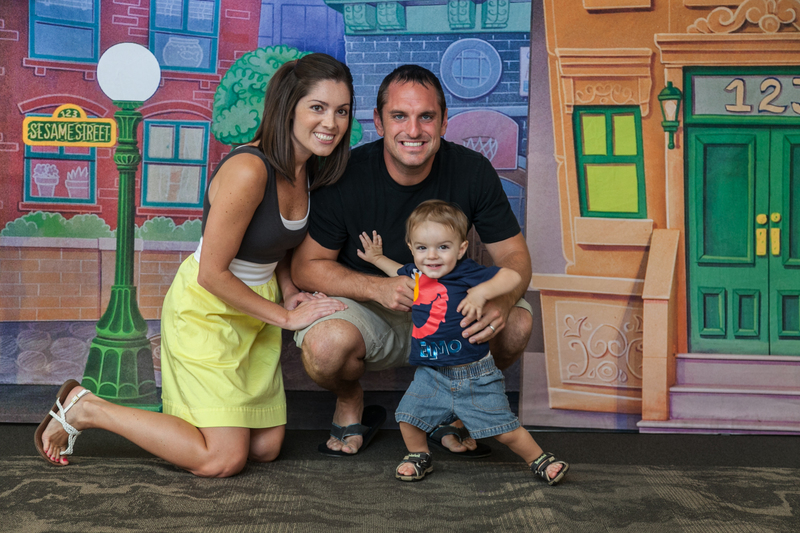 So when we found out that Sesame Street Live was coming to our city over Labor Day weekend, we couldn’t resist. That being said, I had low expectations for how this would all play out. I mean, how plausible was it for a 14-month-old to sit through a stage show, especially one where life-sized characters were singing and dancing around? Not to mention that it would be dark and extremely loud. 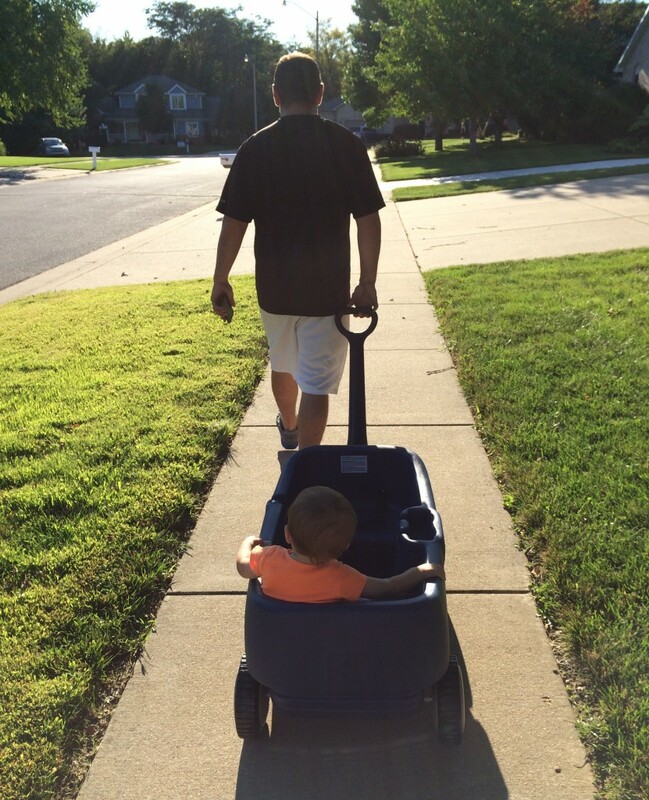 We agreed that he would either completely love it…or be completely scared out of his mind. 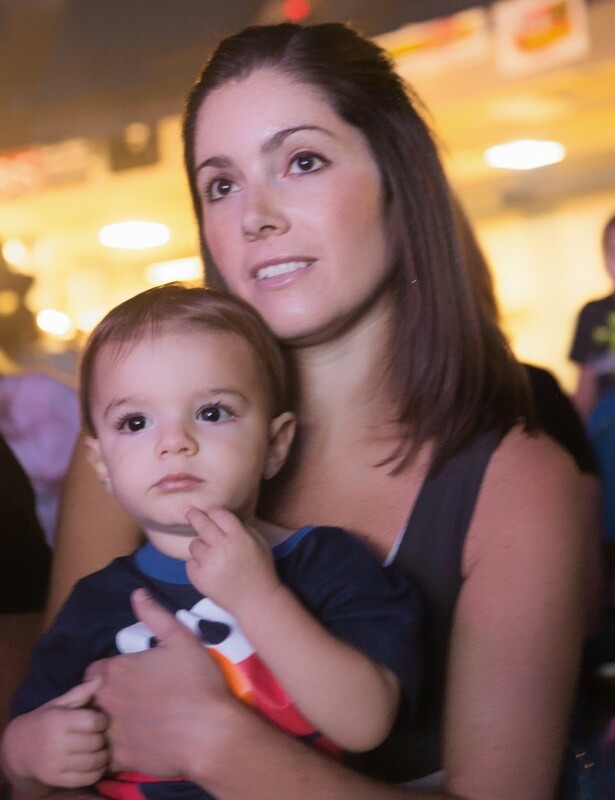 Captivated, mesmerized, entranced: those three words best describe Parker’s reaction. This is a boy who does not like to sit still for longer than a minute, but the only moving he did during the show was from one lap to another. He kept his eyes on the action the whole time, and didn’t make a peep. 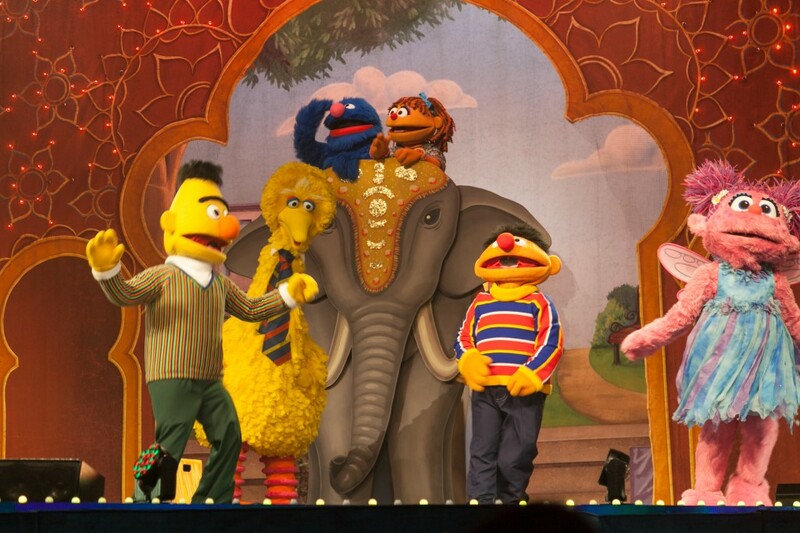 I noticed that all of the other children in the audience were just as attentive, which leads me to believe that Sesame Street has these kids completely figured out (or maybe they put something in the air in the auditorium, haha). I didn’t see my first musical production (Peter Pan at The Muni, an outdoor summer theater here in Springfield) until I was 4 or 5, so Parker has me beat by a few years. I’m so glad we took the chance on attending the show, because he had the time of his life. It was really fun to watch his reaction and experience it through his eyes. For more mama moments and Parker updates (including an abundance of adorable photos and videos), check out my family blog, www.therambachs.com. 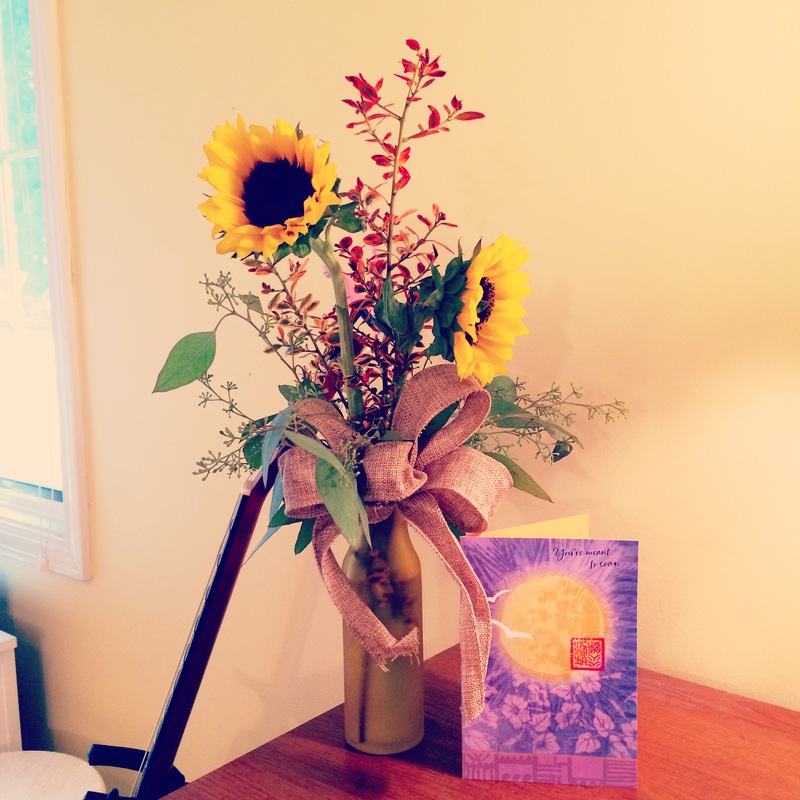 The weekend before my first day at the new studio, my mom gave me a happy sunflower arrangement and a card wishing me good luck. They’ve both been sitting on my desk since then — a nice reminder of how supported I am by not just my mom, but everyone in my life. Since that first day of work, I’ve gotten phone calls, texts and emails from people asking how I like working in my new space. Just about every single parent, and even many of my students, have asked when I’ve seen them for lessons or music therapy. Here’s the honest truth: I love it. Like, more than I ever thought I would. After working from home all these years, it’s a huge change, made even more significant because I’m leaving Parker (whereas before, he was just a few rooms away). But there is such a thing as spending TOO MUCH time at home, even for this self-proclaimed homebody, and I had reached my limit by the end of the summer. Now I look forward to getting in my car, making the five-minute drive to work (and more often than not, stopping for an iced coffee — an extra perk of having a “commute”) and then at the end of the day, coming home to my family. Even though I bring a lot of work home with me, the fact that I physically leave my work space helps me separate the two much more so than before. I have to giggle, because a lot of people have been a little…sympathetic…when they ask how I like working away from home. I myself thought it would be a more difficult transition than it actually has been, so it feels good to be able to reassure them that I am extremely happy with the new arrangement. But here’s the most important thing of all: my STUDENTS are happy in our new location. Change is harder for some of them than most people, but so far they’ve all handled it like champs. And their parents, too; I am extremely grateful to work with such wonderful families who have supported my many, many transitions since starting my business. My hope is that a month and then a year from now, I can give you the same report. Thanks to all of you who have provided encouragement and lovely feedback throughout this adventure so far!